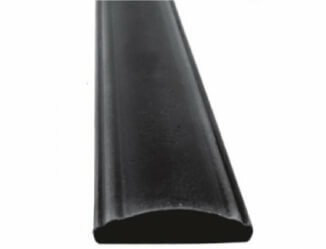 Mild Steel Convex is mainly used for handrail, available from stock in 6 metre lengths section sizes 40 x 12 & 50 x 12. Can be cut to length if required. Mild steel convex bars combine strength with workability. Low cost of mild steel production also makes this type of steel bar desirable and economically viable within many construction projects. Frames can be supported and strengthened by using mild steel convex bars as they are durable and strong. The recyclability of these bars also make them ideal for semi-permanent structures as they can often be used again in other structures or projects. These steel rods can also be implemented in some fencing projects in order to increase fence durability and strength.